Gains ATK equal to the original ATK of each “Altergeist” monsters it points to. When a Spell/Trap Card or effect is activated (Quick Effect): You can Tribute 1 “Altergeist” monster this card points to; negate the activation, and if you do, destroy that card. If this card is sent from the field to the GY: You can add 1 “Altegeist” card from your Deck to your hand. You can only use this effect of “Altergeist Hexstia” once per turn. Altergeist Hexstia is the Link 2 for the archetype, and an incredibly easy one to get out. Two Altergeist monsters, which you can get off of Marionetter. Its power-up effect, while good, will only point to one Altergeist monster. The max you’ll get is a 2200 boost in ATK, which is pretty good. Negation ability via Altergeist tribute, but Hexstia has to point to the monster, dropping its ATK. Negation does help you control, so the tradeoff is dependent on the situation. RoTA for any Altergeist card like Marionetter helps break even off Hexstia’s destruction. Hexstia is balanced all-around. ATK, effect(s), there isn’t much about Hexstia that says is isn’t a fair card. Combos well with Multifaker to keep getting you monsters back to one of the zones Hexstia points to as well as replenishes the negation ability. What makes the difference with why this card is better than others: the negation isn’t once per turn. 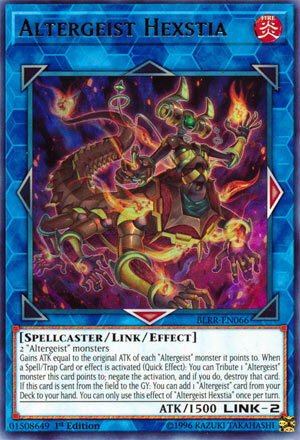 Probably the most popular of the Altergeist Link Monsters is up for review today, here we have Altergeist Hexstia. Hexstia is a Link-2 FIRE Spellcaster with 1500 ATK and arrows pointing Bottom and Right. 1500 leaves a bit more to be desired on a Link-2, but it does boost its own ATK, FIRE is good with Salamangreat now, but I doubt you’re mixing Salamangreat with Altergeist, Spellcaster is great to have that consistent typing in the archetype, and arrows make this good in the Extra Monster Zone or Main Monster Zone which is appreciated on some Link-2s. The summoning requirements are any 2 Altergeist Monsters, which is easy if you’re playing Altergeist of course. Hexstia gains ATK equal to the original ATK of each Altergeist monster it points to. It’s impossible to point to two monsters with this, but the most it can gain is 2200 if it points to a Dragvirion once we get that in Dark Neostorm, 2100 with the Primebanshiee we already have, or with your main deck the most it’ll gain is 1600 with Marionetter (which is the one I’m sure you’re playing). When a Spell/Trap card or effect is activated (Quick Effect), you can tribute 1 Altergeist monster this points to in order to negate the activation and destroy that card. Thankfully they knew they messed up when this came to the TCG because the OCG version stated what I just previously mentioned while the TCG version only stated Spell/Trap card, meaning you couldn’t negate the effects of Spells/Traps, but it got errataed in the database shortly after and it was reprinted with the new text. The effect would of been good if it only negated Spells/Traps, but adding effects along to it just made it much better because sometimes your opponent already activated a Spell/Trap, meaning most cards will struggle to negate the already activated card, but Hexstia has you covered. Also tributing off something like Meluseek or an extra Silquotous that you control is nice (I mention extra Silquotous since it has an effect to bounce a Altergeist card you control and a card your opponent controls once per turn during either player’s turn, so you’d like to keep at least one). If you can get a Hexstia linked to a Hexstia that points to another monster, you get two negates and two potential cards to grab with the first Hexstia tributing Meluseek for example and the other Hexstia tributing the Hexstia that used its effect and it’ll search since the negation effect isn’t a hard once per turn. If Hexstia is sent to the graveyard, you can add any Altergeist card from your deck to your hand, which I referenced to a lot. Having more flexibility for searching is nice, especially since this will cover any Altergeist Spells assuming the archetype ever gets Spell Cards, which I doubt since they are focused on Traps so much but I wouldn’t count it out. Again, it stings this can’t grab Personal Spoofing, but I guess Personal Spoofing will be so much better if the Altergeist archetype had an easy ability to search for it. Also I can’t forget Hexstia can search if used as Link Material for likely a Primebanshee if you do throw a Primebanshee into your Extra Deck. Hexstia is a great Link for the deck and worth having three of if you are using Pot of Extravagance in the deck, which seems very popular in Altergeist so I imagine you likely are. Art: 4.5/5 Again, Altergeist art is interesting. It’s kinda hard to describe. Next up, we come to Link, and Altergeist Hexstia is a Link 2 Monster, also a Spellcaster, this time of the Fire attribute, with 1500 attack. That’s low, but we are only Link 2, so in hindsight, it’s not terrible. Hexstia requires two theme specific Monsters, but not specific as to what they are for Link Summoning, and arrows are to the direct right and directly below. Anyway, immediately, you see the low attack (appropriate as it may be) isn’t an issue as Hexstia gains attack equal to the original attack of any Altergeist Monster it is Linked with. That could easily throw this card up to 3000 or higher just with one Link. Next, for a Quick Effect, when when a Magic, Trap, OR Effect is activated (talk about versatility) you can Tribute a theme card Linked to this to negate and destroy that card. Said destruction only happens if you negate the effect or card in question. But even if your opponent has to chain something else to either negate your effect, or play something else, you’re still successful in getting your opponent to burn through more of their cards. Finally, if this card is sent from the Field to the Graveyard, add an Altergeist card from your Deck to your Hand. It’s strong, it negates, it destroys, it cycles the Deck, it’s a winner folks. Use and abuse three of these. Art: 5/5 This picture is amazing. The red and darkness with the brightness of the swirls of fire, as well as the dark background on top, but the brightness of the bottom right.